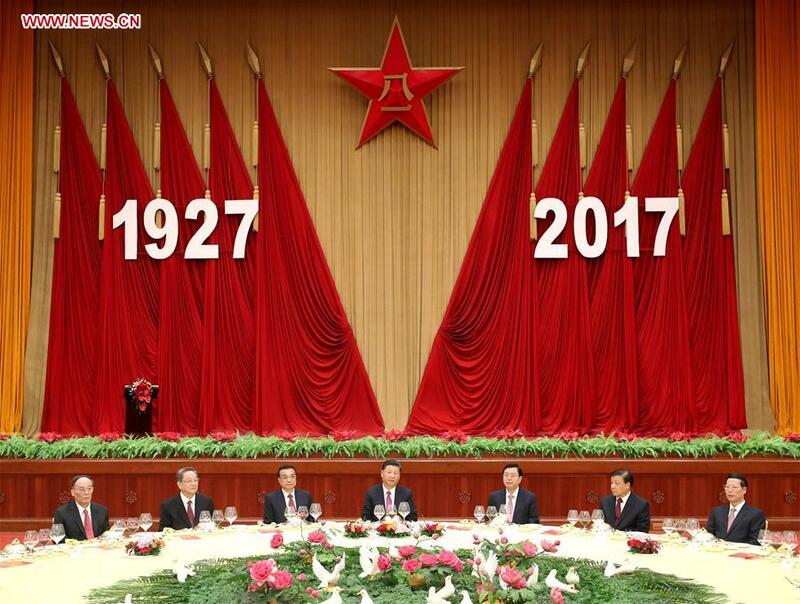 BEIJING, July 31 -- Chinese President Xi Jinping on Monday attended a reception to celebrate the 90th founding anniversary of the People's Liberation Army, which falls on Aug. 1. Xi, who is also general secretary of the Communist Party of China Central Committee and chairman of the Central Military Commission, gave his regards to representatives of army heroes and veterans during the reception, attended by more than 1,800 guests from home and abroad. Other senior leaders of the party and the state, including Li Keqiang, Zhang Dejiang, Yu Zhengsheng, Liu Yunshan, Wang Qishan and Zhang Gaoli, also attended the reception hosted by the Ministry of National Defense. Defense Minister Chang Wanquan made a speech, calling on the armed forces to resolutely fulfill missions entrusted by the party and the nation.